This week marked 100 days until Mockingjay Part 2 comes out. Which is important for people who give special meaning to time when it hits nice round numbers. Lionsgate acknowledged the countdown with this edit of Katniss’s character poster. We saw it when it was released and didn’t think anything of it. Well, we actually thought, “100 Days until Mockingjay Part 2… Could we mark this with some actual news please?” and then moved along with our lives, because there was nothing else released that day. Then a few days later, we notice this E! Online posting. We took a look. We squinted. Didn’t notice anything. Squinted some more at the left side of her nose. Oopsie. Our immediate reaction was a bout of huge laughter, cause it’s pretty clear that this was just a case of unfortunate type placement, and we’re confident it was accidental and not some rogue designer trying to pull a fast one. Since it wasn’t created with ill intent, it’s just hilarious. We’ve never considered the dangerous consequences of breaking into a “0” with the word “until.” And once you notice it, YOU CAN’T UNSEE IT. Sorry. You’ll never look at it with innocent eyes again. We know the internet LOVES stuff like this, so this little graphic that only the fandom was every going to notice gets posted everywhere. 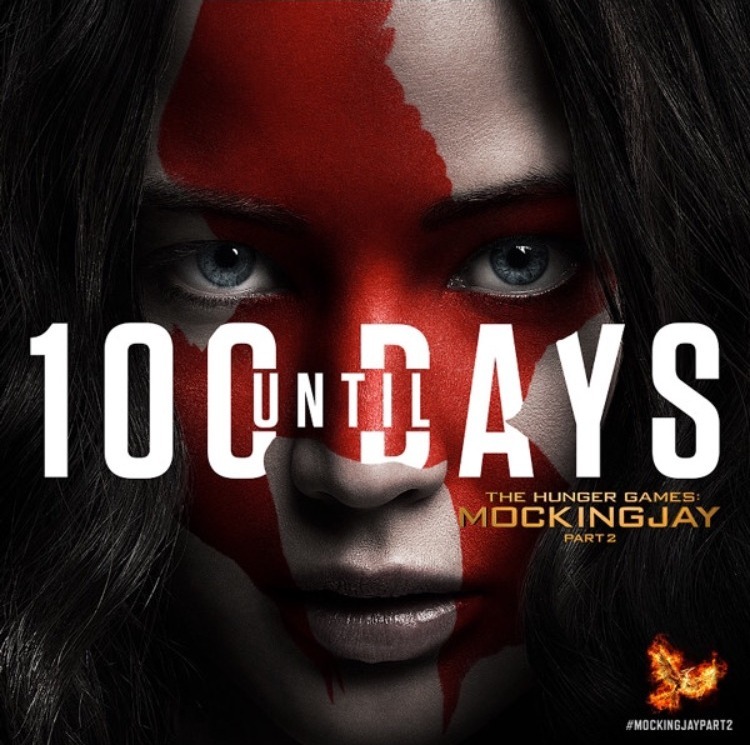 Soooo, bright side, the 100 Days Until Mockingjay Part 2 message gets more buzz, just with an embarrassing twist to it. (Lionsgate had already pulled the it from their social sites as of at least Friday afternoon). I can be a critical person about flubs, but I feel a certain amount of empathy to the designer and people who reviewed this before release. Sometimes you get so wrapped up in the larger design that you don’t stop to squint at it through all the angles. When you’re releasing loads of edits like this, something is bound to happen. It’s not like it’s a theatrical movie poster with a mockingjay beak sticking out of the heroine’s neck or something. Chins up, smiles on, and let’s move on to the next promo.